If you thought that Commodore 64 wasn’t able to emulate, then you’re wrong. Spartan gave Commodore 64 full Apple II+ compatibility and it is one of Commodore 64’s most complex addon product. Possibly the most complex C64 peripheral was the Mimic Systems Spartan, which added an entire new computer architecture to the C64, with its own 6502 CPU and expansion bus, for software and hardware compatibility with the Apple II series. 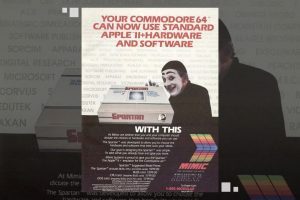 Announced shortly after the Commodore 64 itself at a time when little software was available for the machine, the Spartan did not begin shipping until 1986, by which time the C64 had acquired an extensive software library of its own. 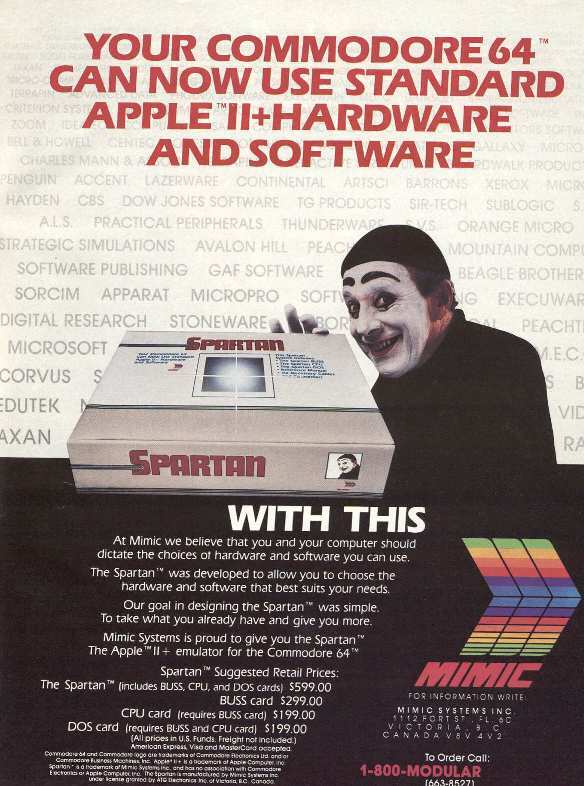 Essentially an Apple II+ compatible computer that used the 64’s keyboard, video output, joysticks, and cassette recorder, the Spartan included 64kB RAM, a motherboard with a 6502 CPU on a card, 8 Apple-compatible expansion slots, an Apple-compatible disk controller card, and a DOS board to add to your 1541 disk drive. The DOS board was optional, but if it was not installed an Apple Disk II or compatible drive would be required to load software. The long delay between announcement and availability, along with heavy promotion including full-page ads running monthly in the Commodore press, made the Spartan an infamous example of vaporware. In August 1982, Commodore was launched. At the same time, this huge emulator hardware addon package was announced. It wasn’t released until 1986, which is after Amiga 1000 launch even. This must be one of the most hyped products ever made as it was announced and promoted ever since Commodore 64 was launched. So, even back in the days. Big projects was also announced many years before it came out.